Anticholinergic side effects include memory loss & mental fogginess. Astonishingly, 50% of the American population are taking Anticholinergic drugs, which are designed to counter the effect of Acetylcholine. to effect all the nerves of the Autonomic Nervous System (which controls those function which are beyond our direct control, for example digestion of food, and contraction of the pupil). In the brain it is arouses and excites adjacent nerves - essential for example in memory. In a study reported in the British Medical Journal scientists, commenting on anticholinergic side effects did cognitive tests on a group of persons over 60 who started taking Anticholinergic medicines like sleeping tablets. None at the beginning of the research showed any signs of dementia. All of these are Anticholinergic side effects of the medication they were taking. 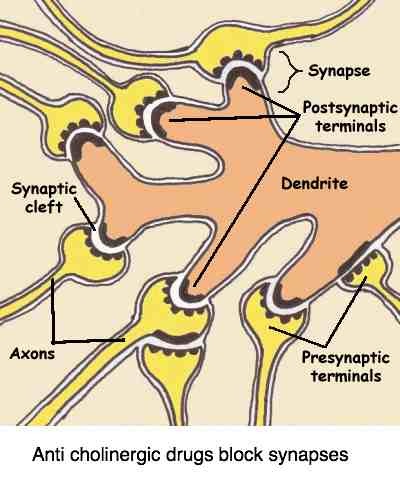 These drugs block the neurotransmitter Acetylcholine. Researchers reporting in the trusted journal JAMA Neurology confirm the long known association between anticholinergic medication and cognitive impairment and an increased risk of dementia in formerly cognitive normal older adults. "Cognitive decline is a major public health care issue, and a well-recognized clinical manifestation of cognitive decline is falls. Seniors with cognitive impairment fall at twice the rate of peers without cognitive impairment.Exercise training may be an effective strategy against cognitive decline and it is recommended for prevention of falls. We recently reported that 12 months of once-weekly or twice-weekly resistance training improved selective attention and conflict resolution compared with a balance and tone program (BAT) among 155 community-dwelling senior women. "Regular use of aspirin, NSAIDs, and acetaminophen can increase the risk of hearing loss." Which anticholinergic drugs? Iatrogenic Illness. Are you taking sleeping tablets, sedatives, anti-anxiety and anti-depressent medication? Antihistamines, Codeine, Anti-inflammatories? Blood thinners. And many others. Forgetful and foggy brain? Have a good chat to your pharmacist! Fully 50% of Americans are taking these drugs. Their anticholinergic side effects may be ruining your brain. Johns Hopkins Medical university states that there are 113 000 deaths per year in the USA alone due to side-effects of drugs and medication errors in hospitals (reported in Journal of the American Medical Association). Are we surprised? 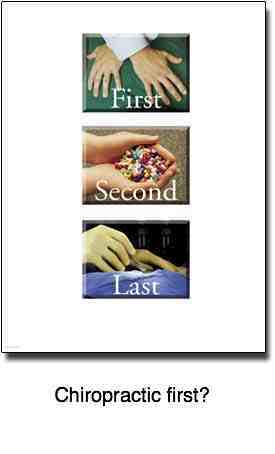 This makes drugs the fourth leading cause of death in the USA after heart disease and cancer. In Alzheimer's disease, nerves in the brain lose their connectivity with other nerves at the synapses. Soon they atrophy and die, and the brain actually shrinks, affecting memory, thinking and ultimately behaviour. Anxiety and difficulty making decisions are amongst the first signs. Ironically, the medication of choice is a pro-cholinergic medicine to increase the supply of Acetylcholine. The drug Acetaminophen is the leading cause of acute liver failure in the USA. Because it is contained in many different over-the-counter drugs (like Tylenol, Anacin, Excedrin and many flu and cold medicines), and prescription drugs, Americans are seriously overdosing on Acetaminophen. This has directly resulted in 458 deaths per year recently. FDA recommends not mixing Acetaminophen-containing drugs, and to avoid them if you drink alcohol or have a liver condition. The toxic effect is worsened in the presence of anti-cholinergic drugs. Is not worth considering chiropractic first rather than risking these terrible anticholinergic side effects? Inside Out, a short story you'll love. At a personal level, I'm so grateful I lived in an era before medication of children became the norm. I tell it all at attention deficit Bernie. "In all affairs it's a healthy thing, now and then, to hang a question mark on the things you have long taken for granted. A 53-year old patient with a history of a suspected mild heart heartattack was placed on Warfarin, a blood thinner. Last year her doctor insisted she had the flu shots to make sure she didn't get the flu as it might overstrain her heart. Within three days she became extremely ill with flu, which lasted over a month. This year? She started getting some flashing lights in her eye, signs of a retinal tear. The ophthalmologist confirmed a small tear and advised routine laser therapy. But he didn't ask her, and she didn't tell what drugs she was taking... the laser surgery caused massive bleeding behind the eye because of the anticholinergic side effects of the blood thinners that she was taking, killed the optic nerve, and she's now stone blind in that eye. Personally I would virtually NEVER take the flu shot. In one year Medicine admits that it caused a doubling of the rate of a very serious neurological disorder called Guillian Barre Syndrome. That year the flu shot killed more people than lives saved. I wonder how many other diseases it also caused? Drugs are dangerous! Scientists at the Laboratory for Neurosciences in Bethesda looked for a link between the amino acid HOMOCYSTEINE (produced from the metabolism of the protein in meat) and the vitamin Folic Acid. They found that mice deprived of Folate had high levels of HOMOCYSTEINE and were particularly vulnerable to neurotoxins. Then, when the mice were fed Folate, their homocysteine levels dropped and they were able to repair the neurons damaged by the toxin. As we've seen the neurotransmitter ACETYLCHOLINE is the brain's memory molecule. SAMe, a vital body chemical, is produced from HOMOCYSTEINE. SAMe helps produce and activate the ACETYLCHOLINE in your brain from CHOLINE, an important foodstuff found in eggs and organ meat. This process requires high levels of anti-oxidants like ZINC and the B VITAMINS and FOLATE. This is complex biochemistry. Don't fuss over these names. But do recognise that anything that lowers ACETYLCHOLINE in your brain will inhibit your short-term memory. That could be Alzheimers or old age dementia. What is betaine, and its precursor choline, is a very important subject for all those suffering from anticholinergic side effects. It's the vitamin like substance involved in the methylation, read degradation, of toxic homocysteine. Rather we should be looking at procholinergic foods that will enrich our memories, better control muscle contraction including the heart, and improve the digestion of our food. An understanding of what is betaine, and choline food sources is so important for all of us, but especially those suffering from anticholinergic side effects. 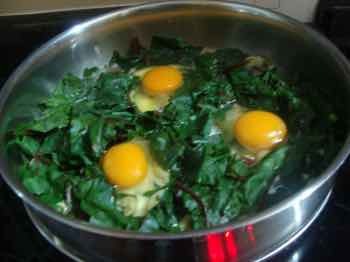 There's no better place to start than an egg poached on a bed of beet greens or spinach; a rich source of betaine and choline. Use free range cage free eggs if you can find them; serve it on a toasted slice of bread made from 100% healthy flour; it's hard to find, and I chose to bake it myself. It takes only five minutes every morning. Remember a life without medication should be the goal of each and everyone of us; if you are suffering from the ravages of anticholinergic side effects then it's time to stop and consider before you lose your mind.